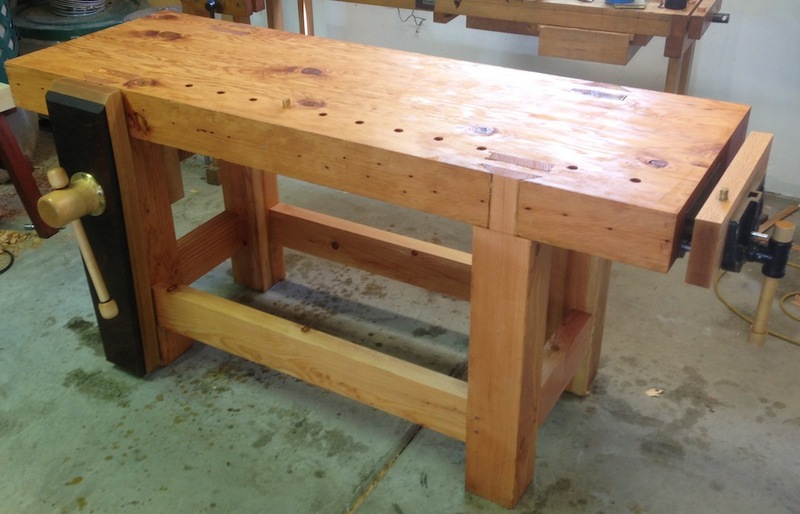 Well, this took me forever to get done, but my workbench is finished and ready to go to work. I’m pretty excited to be able to off the old wobbly pseudo bench. 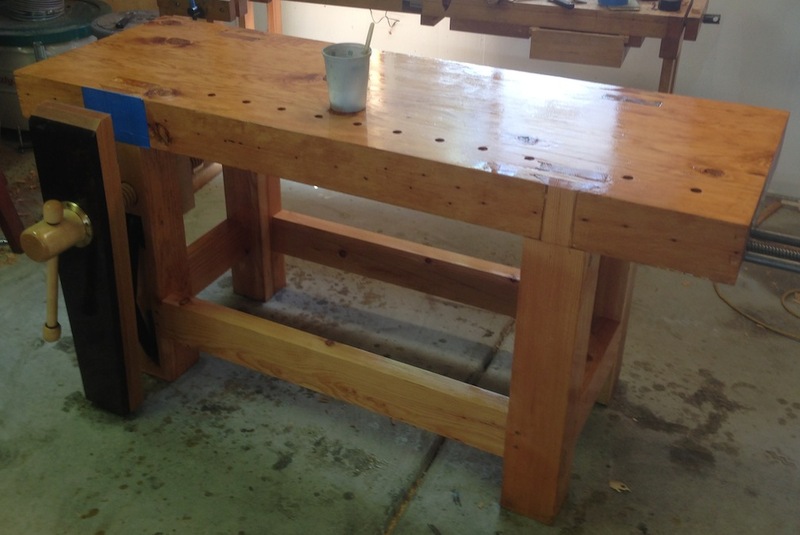 If you are a beginning woodworker, living in the San Francisco Bay Area, and want my old bench speak up now. It’s yours for a song. Litteraly., a song. Just hum a few bar of “taps”, load it into your pick up truck and take it home. 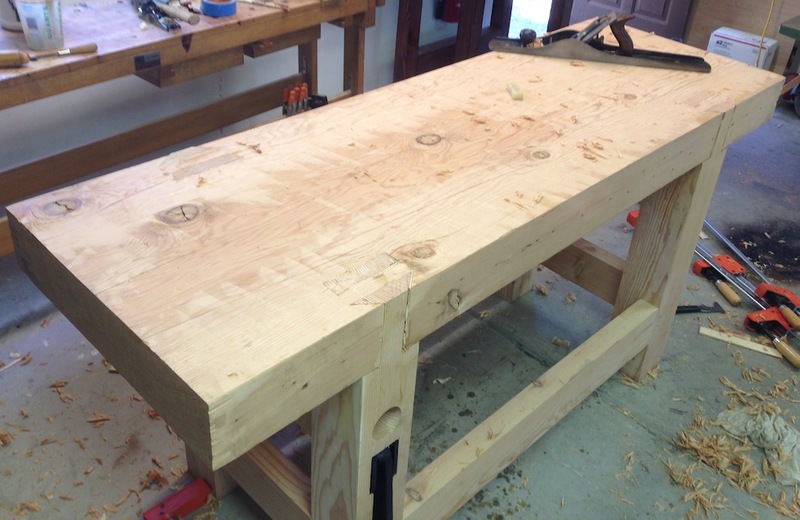 I’ll even help you load it and offer my opinion on how you could make it into a more robust work bench. After the big glue up I let the bench sit for several hours (it was hot yesterday), then cut off the wedges and planed the top flat. 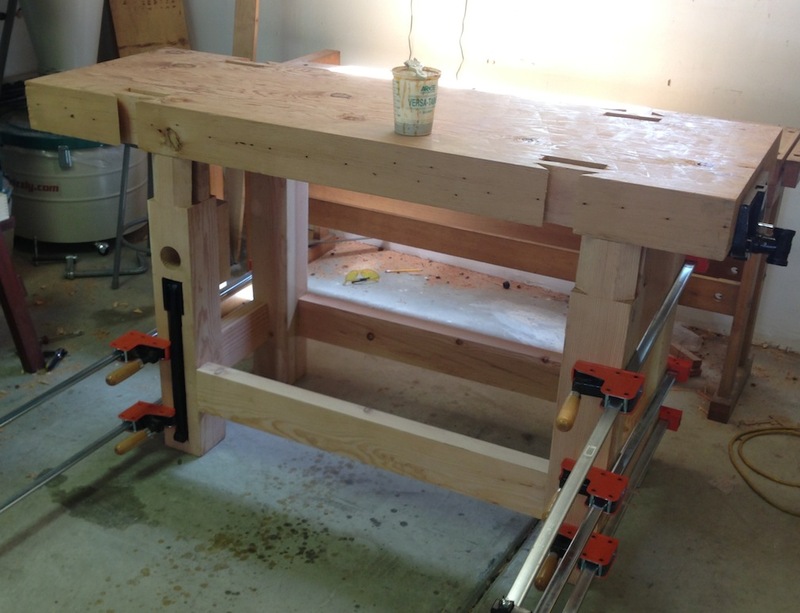 I installed the chop on the end vise and planed it to the level of the bench, and also planed the top of the leg vise level with the bench top. I used to be afraid of flattening the bench top, but it seriously took me longer to sharpen the blade in my #8 jointer than it did to flatten it. Having to work a nick out of the blade took the most time, but I got it razor sharp and it cut the top (knots and all) like butter. 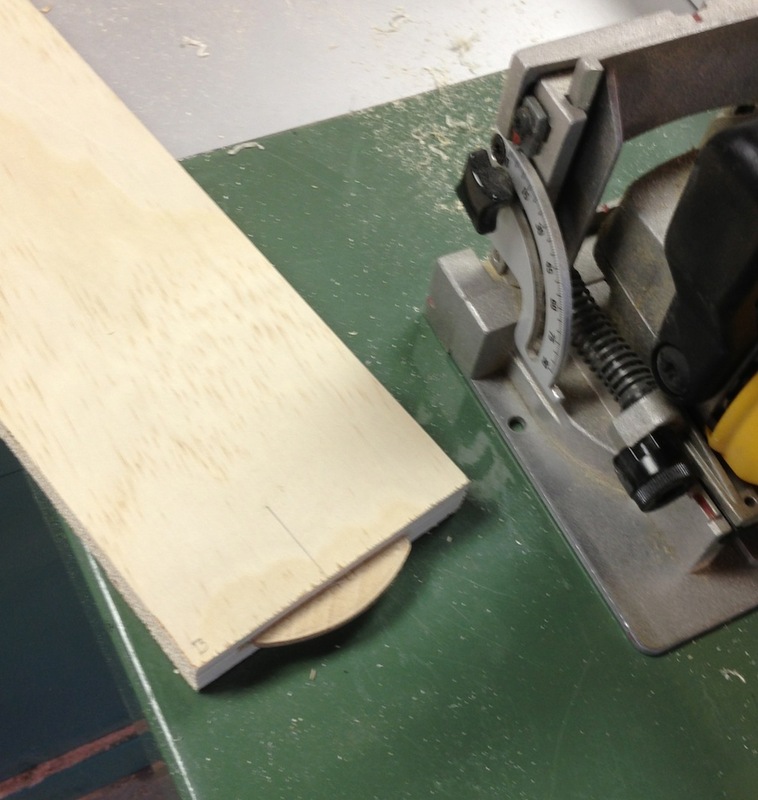 First pass with the jointer plane, traversing. Note the low spots in the middle. Second pass – I’m taking pretty light cuts and the low spot is quickly diminishing. Flat. It took about 4 passes to get it flat. one traversing directly, three cutting at a 45 degree angle. Then I made two more passes lengthwise to remove any tear out. 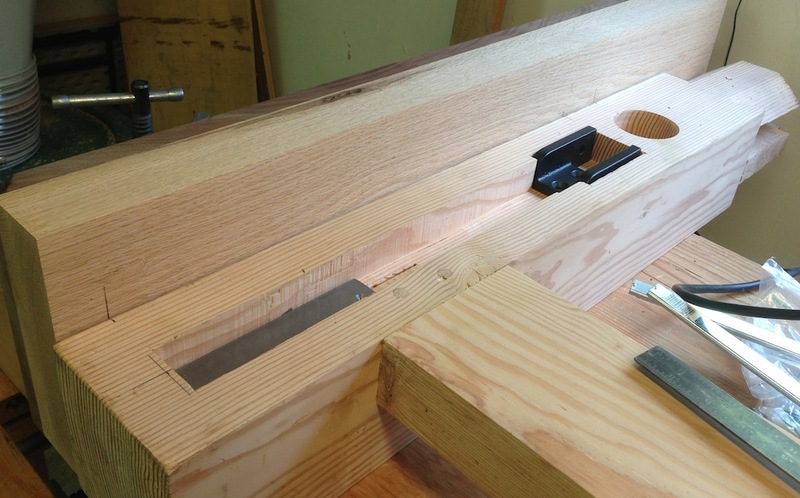 Leg vise final installation, top trimmed flush with the bench top. Laying out and drilling the dog holes. Masking off the clamp area – I’ll glue leather in here after the finish dries off tomorrow. 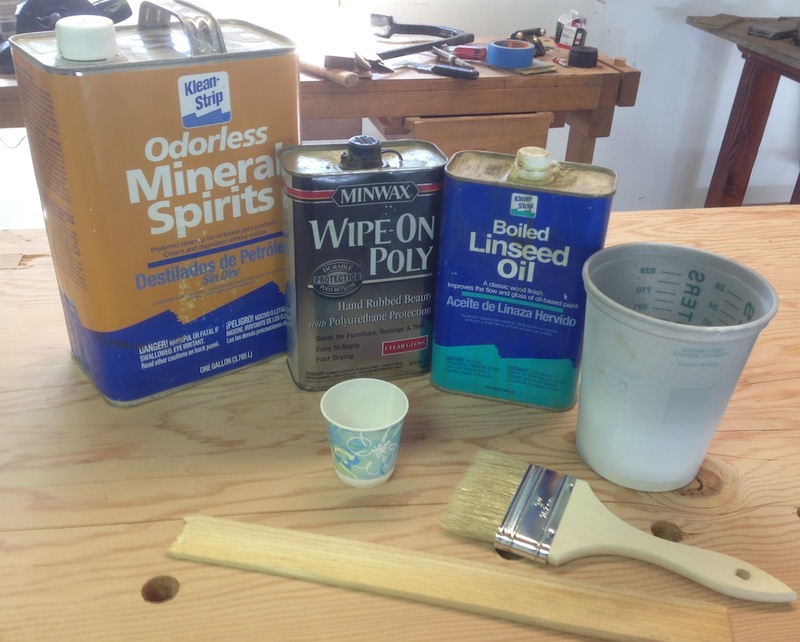 Finish Schedule: Mix equal parts of BLO, Poly varnish and mineral spirits, slop on, let soak in, wipe off. What’s next? I’ll glue leather in the vise jaws, slop on more finish tomorrow (maybe) and add a shelf between the stretchers (some day). Mostly I’ll clean up the shop, and start a new project. And I’ll help *you* load up my old workbench when you come to pick it up. You know you want it. 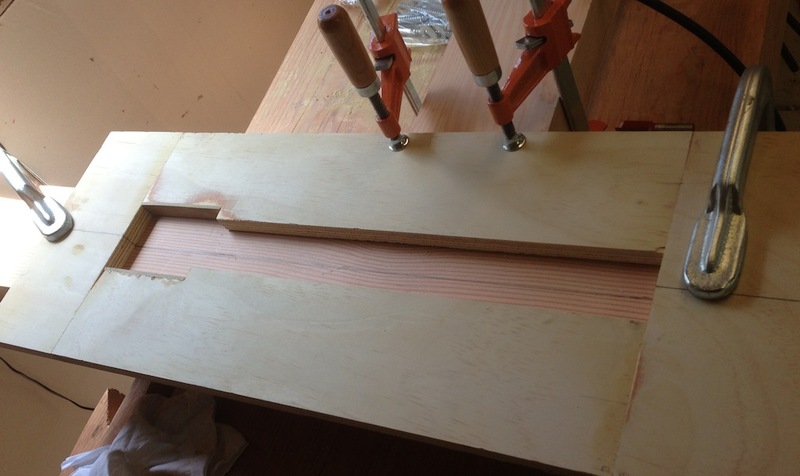 I did it, the bench is glued up. 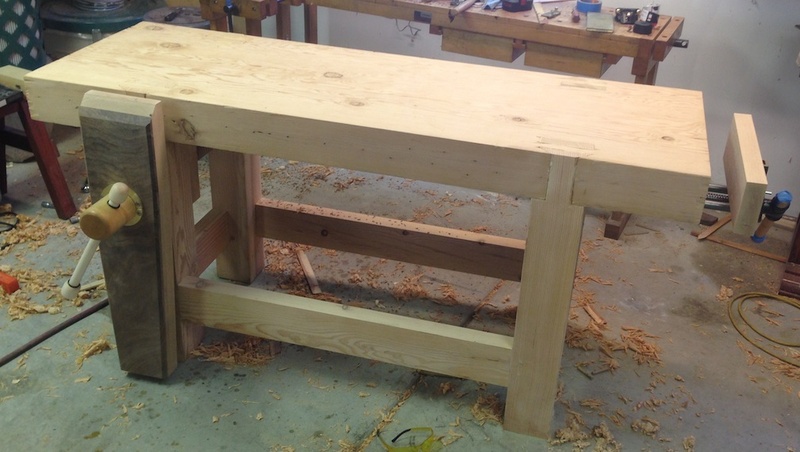 It’s down to just a few details (flattening, bench dog holes and finish) and the bench will be DONE. I wanted to take care of as many details as I could before gluing up. 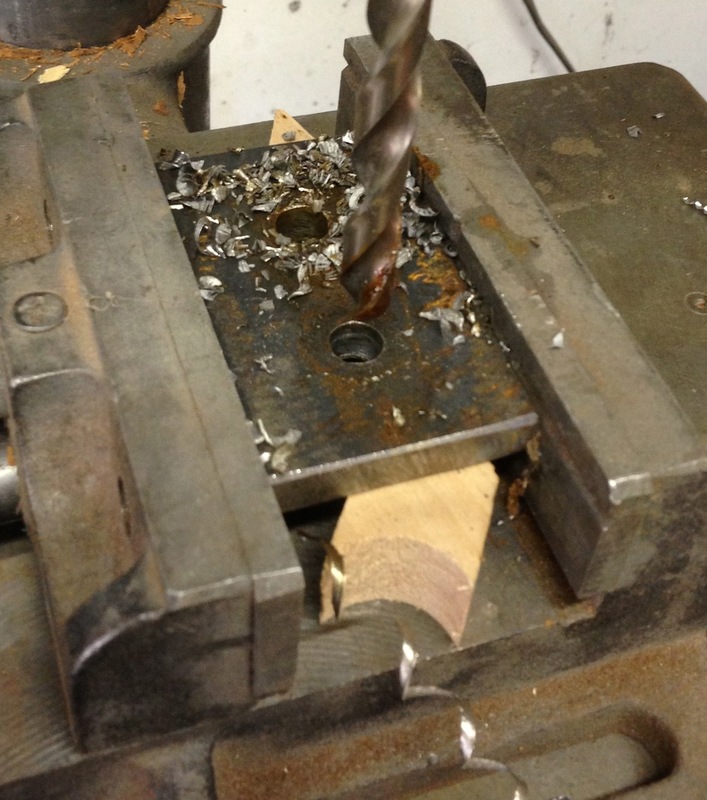 I got the threaded block for the vise screw installed. I used blue tape to center the screw in the hole, then threaded the nut block on the back, marked and drilled holes for lag bolts to attach it. While I had it all assembled, I fit the brass garter and drilled the mounting holed for that. 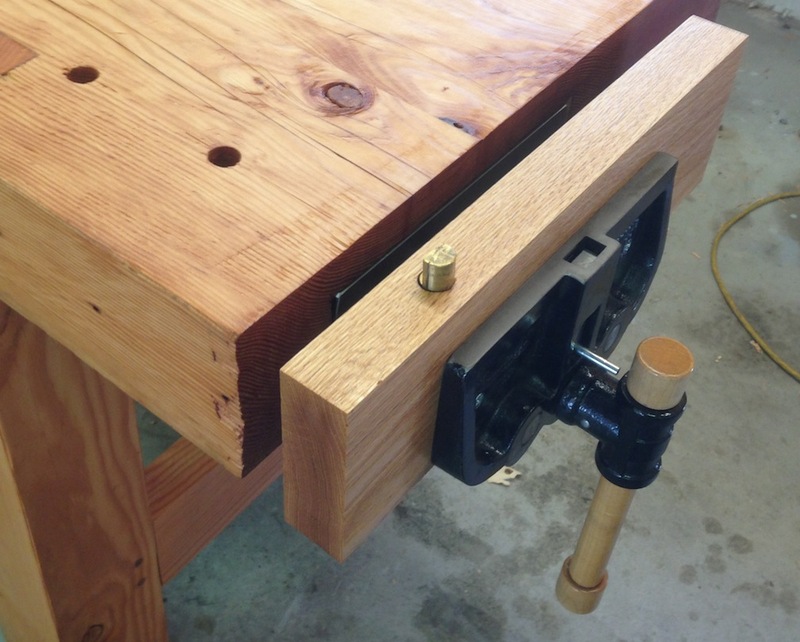 I decided it would be easier to install the end vise now, while the bench top was upside down. I got new lag bolts, and added some shims behind the face so that the inner face was perfectly flush with the end of the bench. 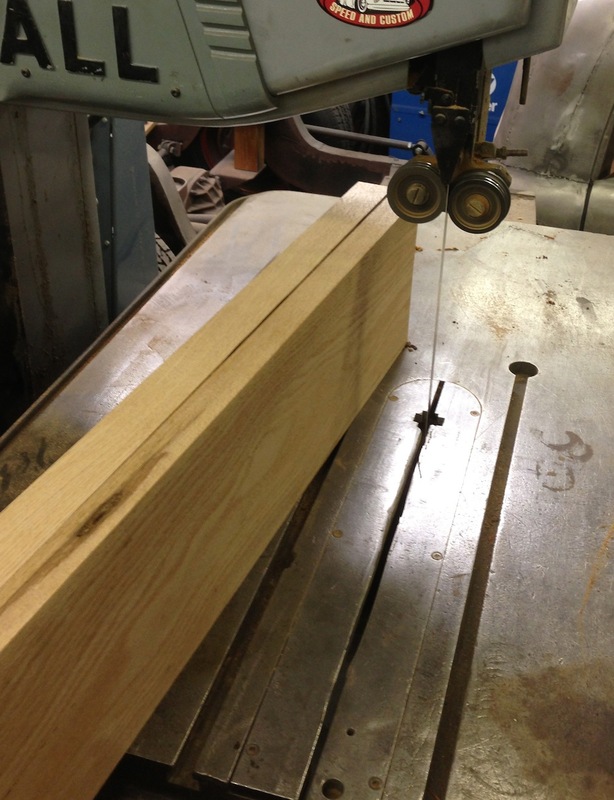 It was about 1/16″ shy on one side and maybe 3/32″ on the other. It’s just right now. 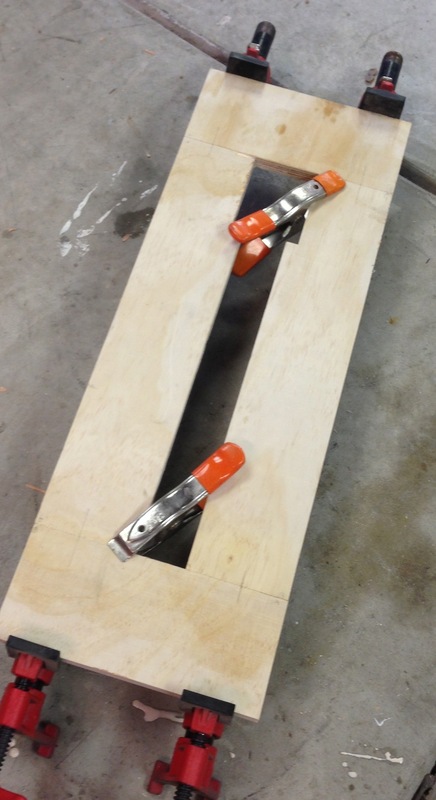 I glued up and pegged the short stretchers, and then I was ready to put the top on. The big question was how was I going to get the glue applied and the bench top in place by myself? It’s HEAVY. I decided to position it on top on top of the legs, slather glue on and then scoot it over so it would drop onto the tenons. It worked OK. 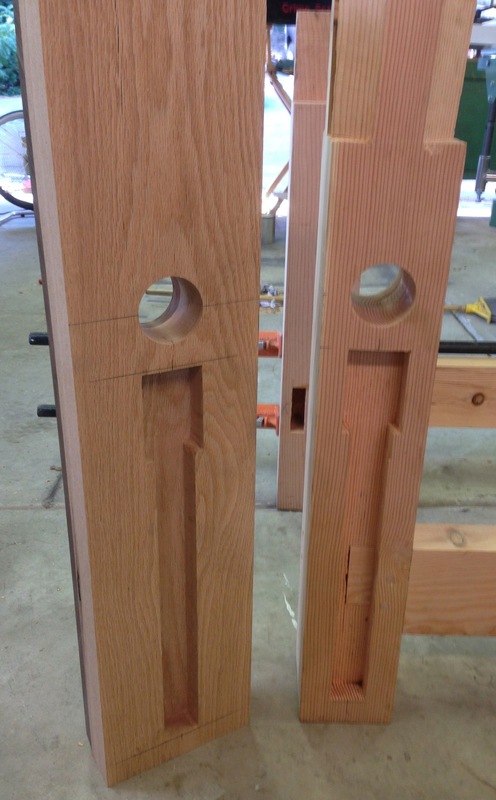 The fit (read “sloppy fit”) on the through mortises worked to my advantage here. Once the top was on I drove in wedges in all the gaps to close them up. 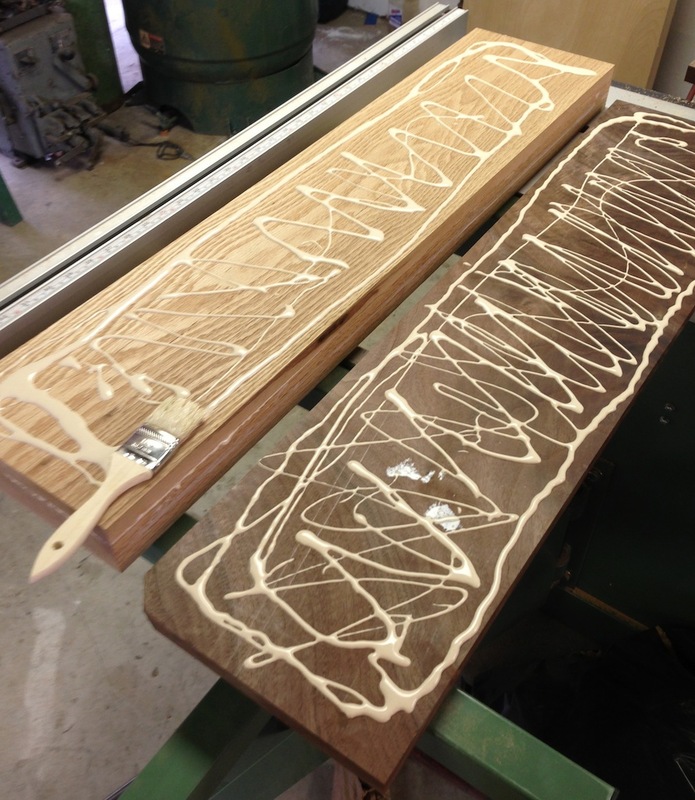 I’ll let this dry for a few hours and then saw the wedges off and flatten the bench top. On your mark, get set, GO! 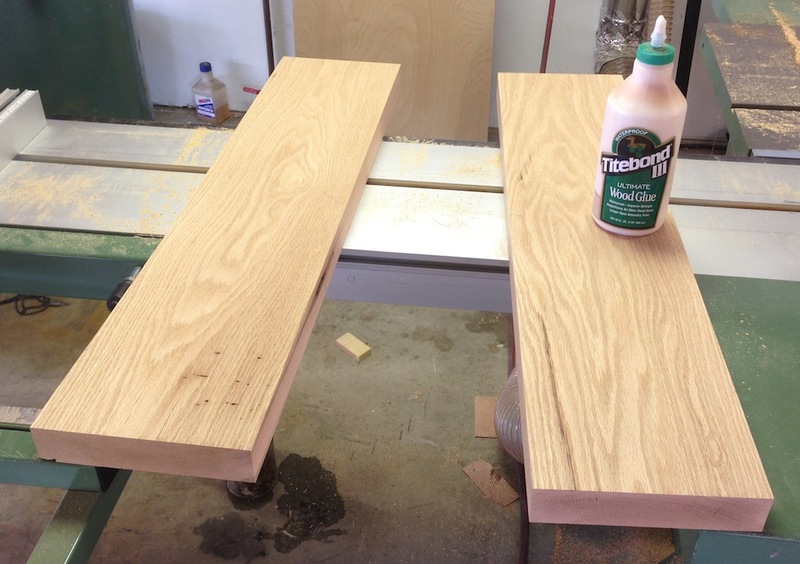 Getting glue onto 8 mortises and 8 tenons (and not everywhere else) by yourself isn’t a relaxing process. Time for a lunch break now, I should probably leave this to dry over night before I do anything else to it. Wow, a major milestone, measured in baby steps. I got the Crisscross guide installed, and it works like a dream. It wasn’t hard, I got it done in about 4 hours while dealing with several work crisis. 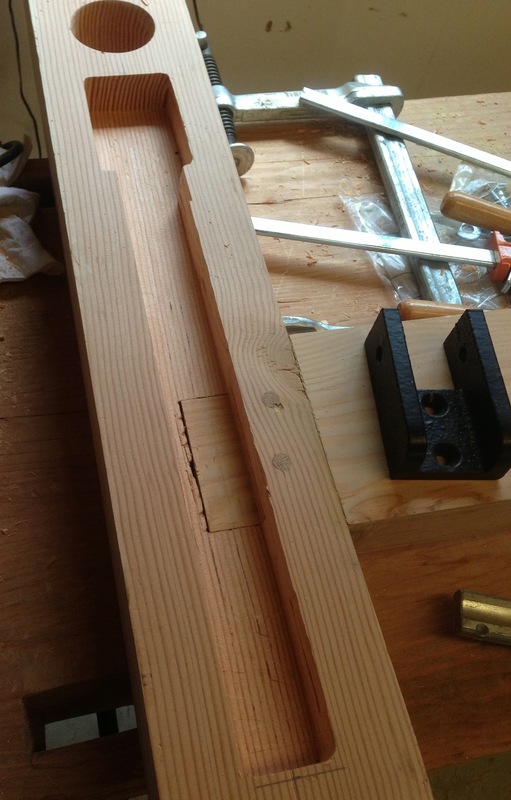 The first operation was to clear out the “mortise” for the Crisscross mechanism. I made a template yesterday, so it was just a matter of figuring out where I could put the clamps and routing out the waste. I did it in about 5 steps down, vacuuming out the chips before going deeper each time. Then I squared up the corners with a chisel and installed the hardware. Tapping holes in wood felt weird, but it seems to work OK. Done! 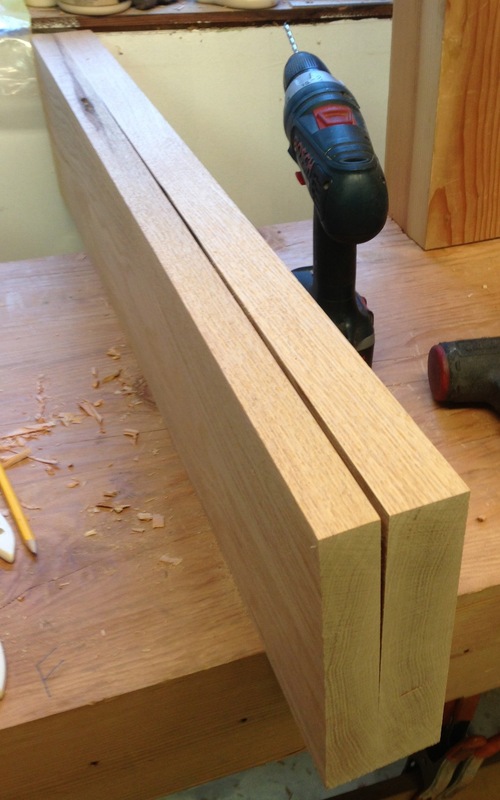 Check out the fit on that tenon! 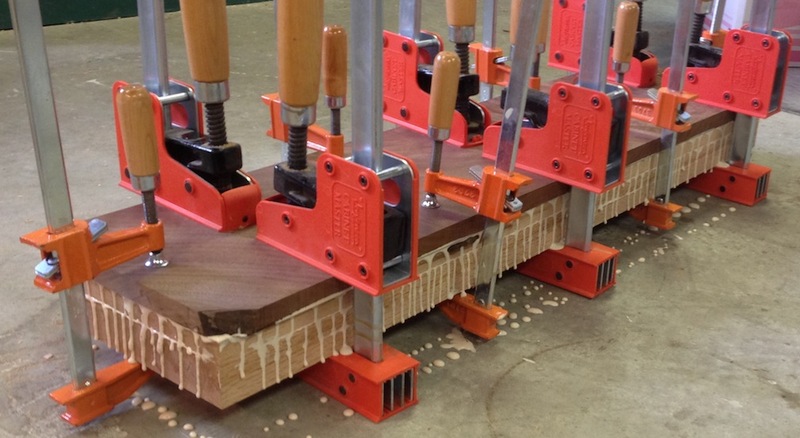 Unclamping the glue-up for the leg vise chop was anti-climatic. I half expected it to make a springing sound and twist itself into a double helix. I bandsawed the Walnut overhang off, and planed the edges square. When laying out the location for the holes in the chop I made sure it would end up about 1/8″ proud of the bench top, after I’ve flattened the top of the bench I’ll trim the chop to match For what it’s worth, that Claro Walnut isn’t real hand plane friendly. It’s hard and has lots of twisty grain. 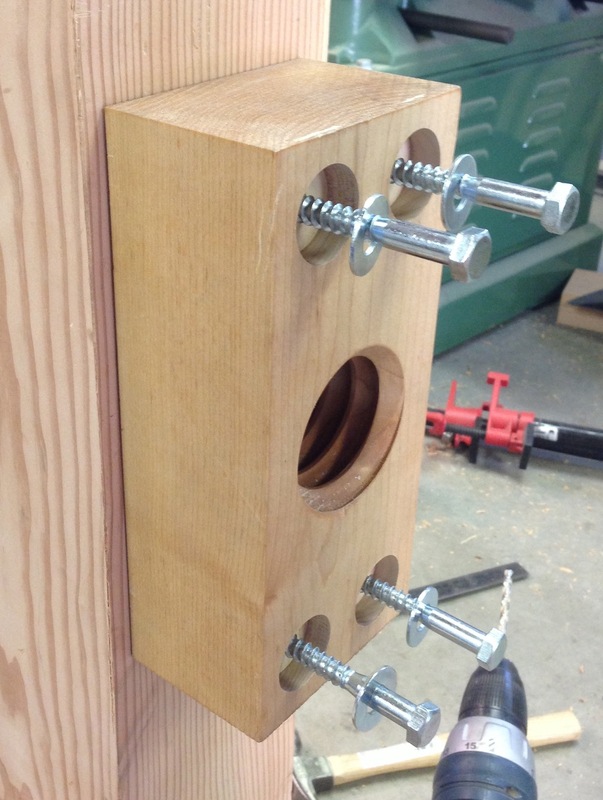 Installing the mounts for the Crisscross glide requires tapping holes into the wood, I used Tried & True Oil/Wax finish to lubricate the tap, and a bit on the threads of the machine screws that go into the threaded holes. It should lubricate it if I need to take it apart, and should set up and provide a little extra strength over time. The Crisscross mechanism works really well. 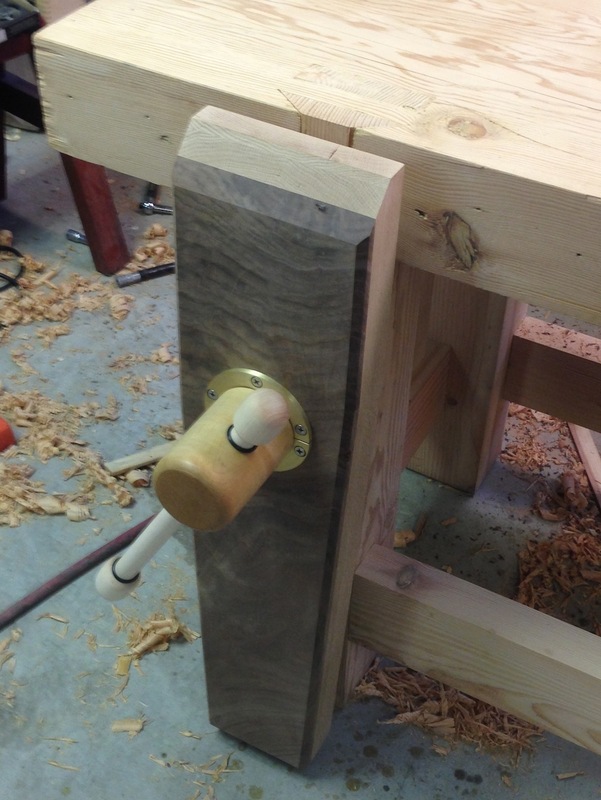 It’s smooth and completely supports the vise chop. 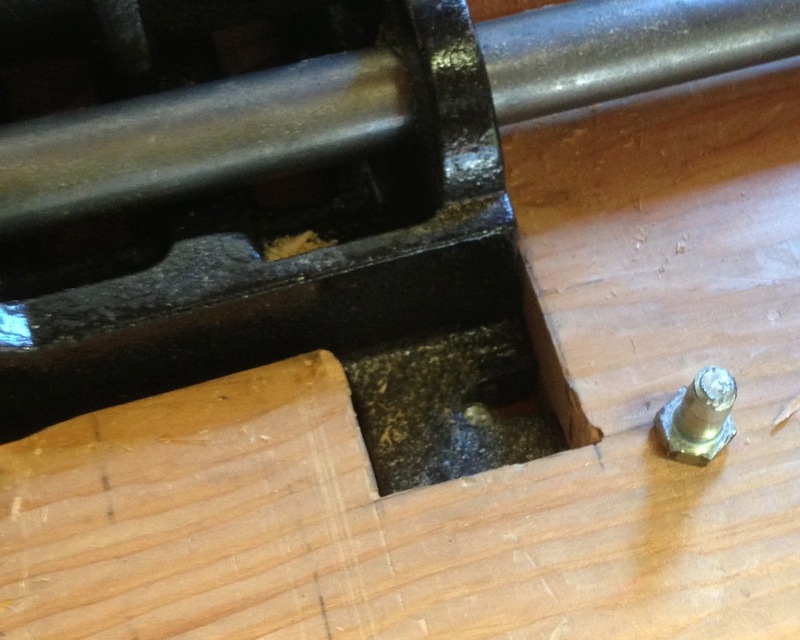 The hole in the chop and leg for the screw line up *exactly*, so there won’t be any weight or binding on the vise screw. With the other mechanisms (parallel guide and pinless guide) the collar on the screw is required to help maintain alignment. Good progress this afternoon, even with having to run down to Santa Cruz for glue. 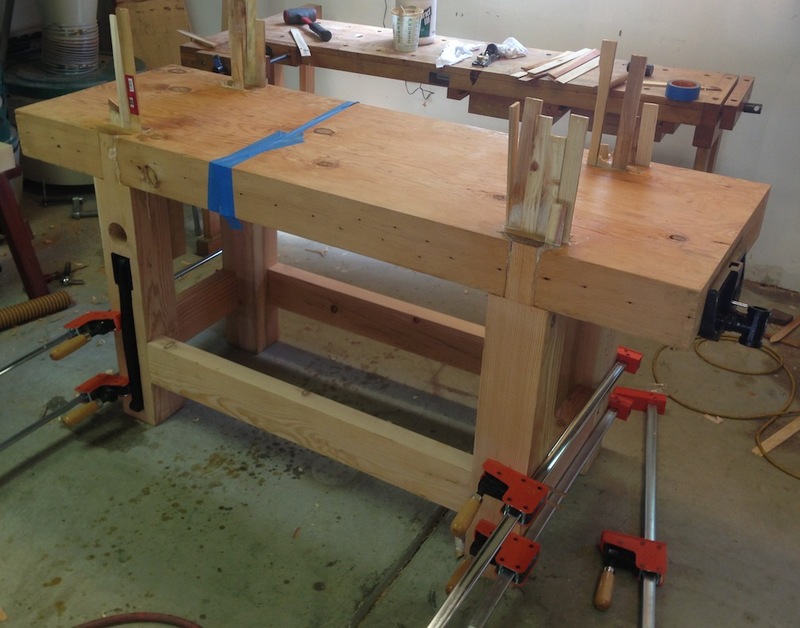 I decided to do everything I could to get ready to glue up the bench except routing the mortises for the Crisscross vise guide The main job was to get set up for draw boring the legs and stretchers. 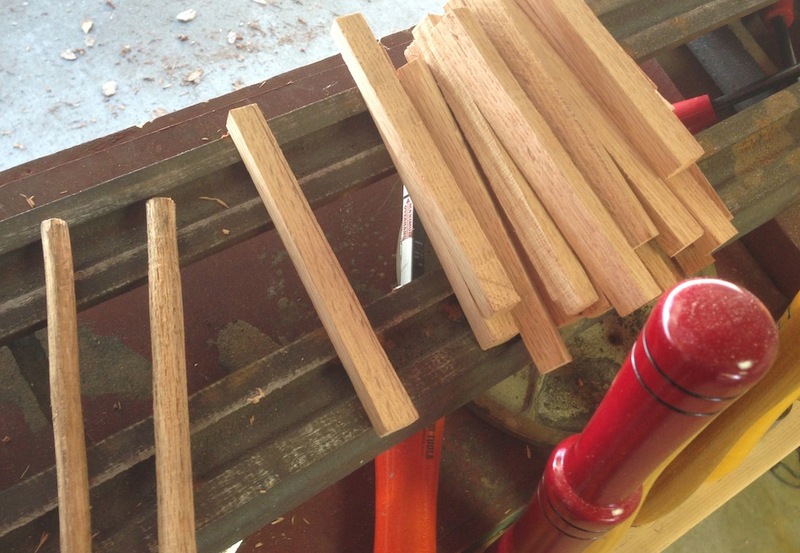 I had some “curly red oak” scraps left over from the leg vise disaster so I thought I’d make some oak pegs. It was pretty straightforward, although somewhat time consuming to make all of the pegs. 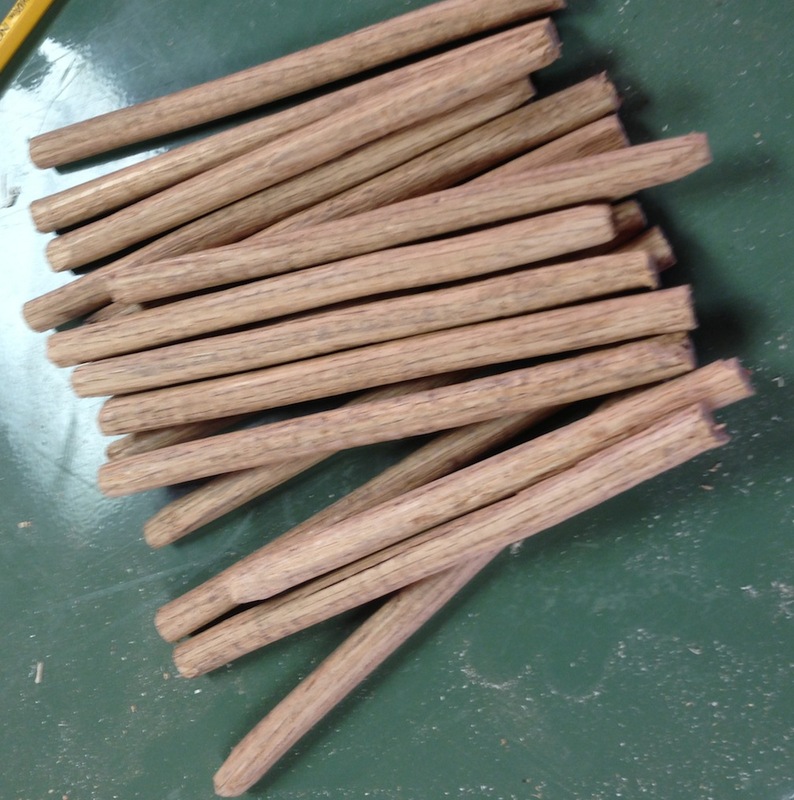 I’ll have to order a Lie-Nielsen dowel plate someday, but I figured I could make one that would do the trick today. 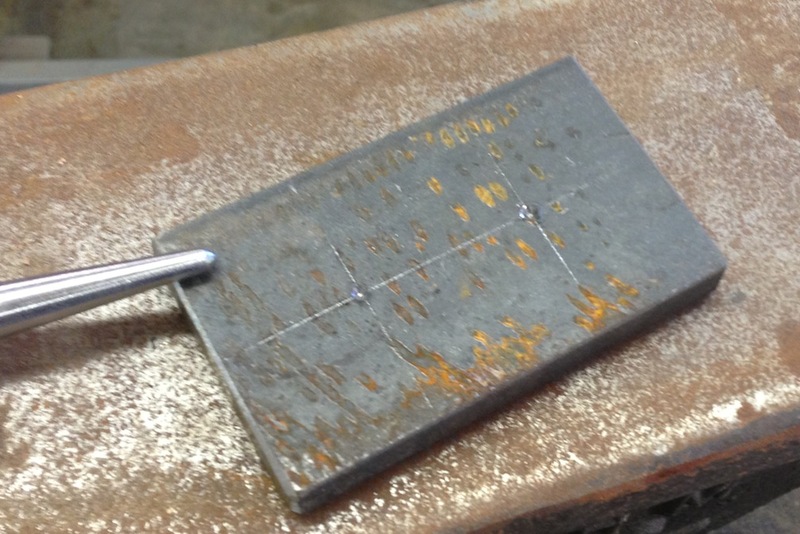 I drilled two holes in a scrap of plain hot rolled steel plate, one 3/8″ (the finished peg size) and one 7/17″ (to use to rough dimension the pegs). Then I ripped up an offcut of the red oak, chamfered one end of a piece and pounded it through the larger hole, then the smaller hole. It worked, but I was concerned about how much force I had to use. I decided that it would be easier if the pegs were closer to the right size so I fired up the lathe and turned them all to a round shape before driving them through the steel plate. It only took maybe a minute per peg to turn them round, so it seemed like it was worth it. 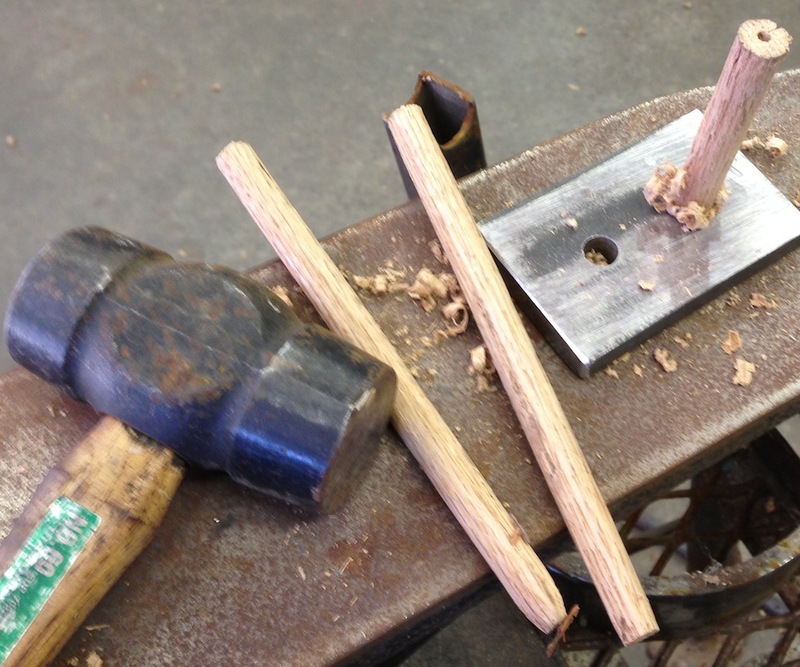 Once the pegs were ready I decided to drill the holed in the legs and stretchers. 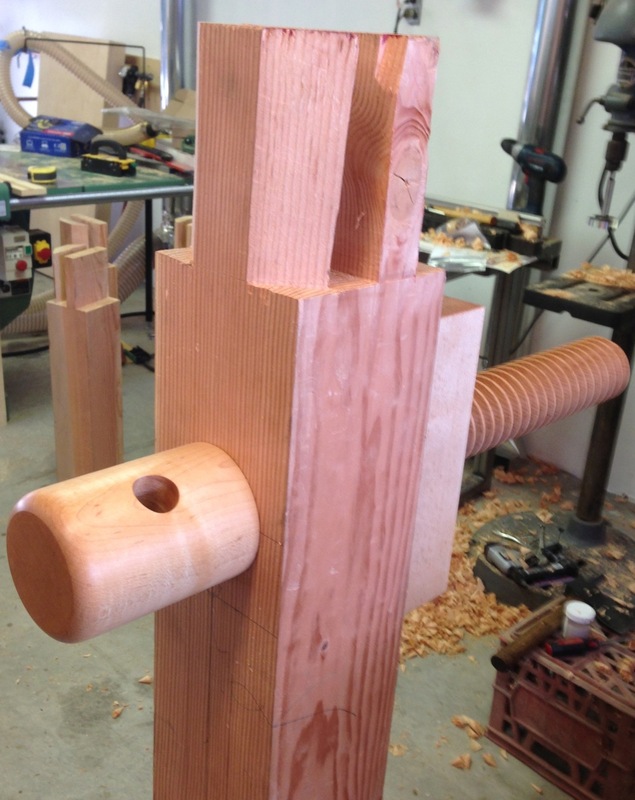 I drilled all the leg holes, than assembled the legs with the stretcher, marked the location of the hole on the tenon, and then drilled the hole in the tenon offset 1/16″ closer to the shoulder of the mortise. 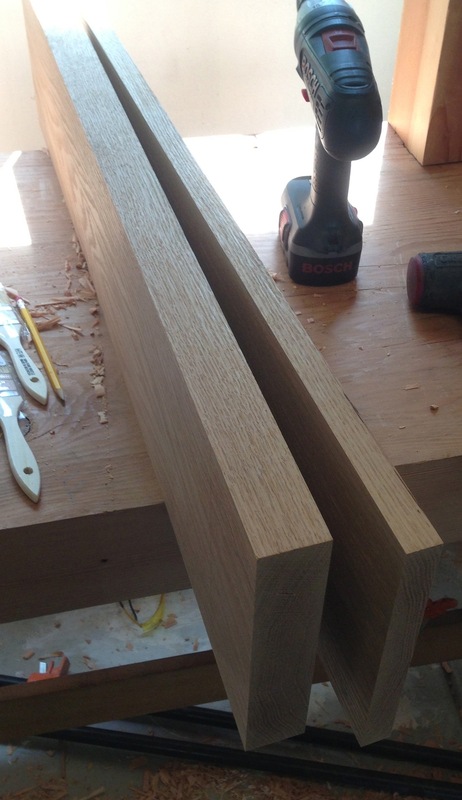 WHile I was doing this I was thinking about routing the mortise for the Crisscross guide, and the fact that the tenon is going to be right in the way. So I decided to glue up the front legs and stretcher so IU can machine the slot in one operation, including cutting away the tenon at the same time. I checked the assembly for square after I drove in the pegs and it was perfect. By tomorrow morning this should be dry enough to cut the slot. I think I can get the entire bench glued up tomorrow! 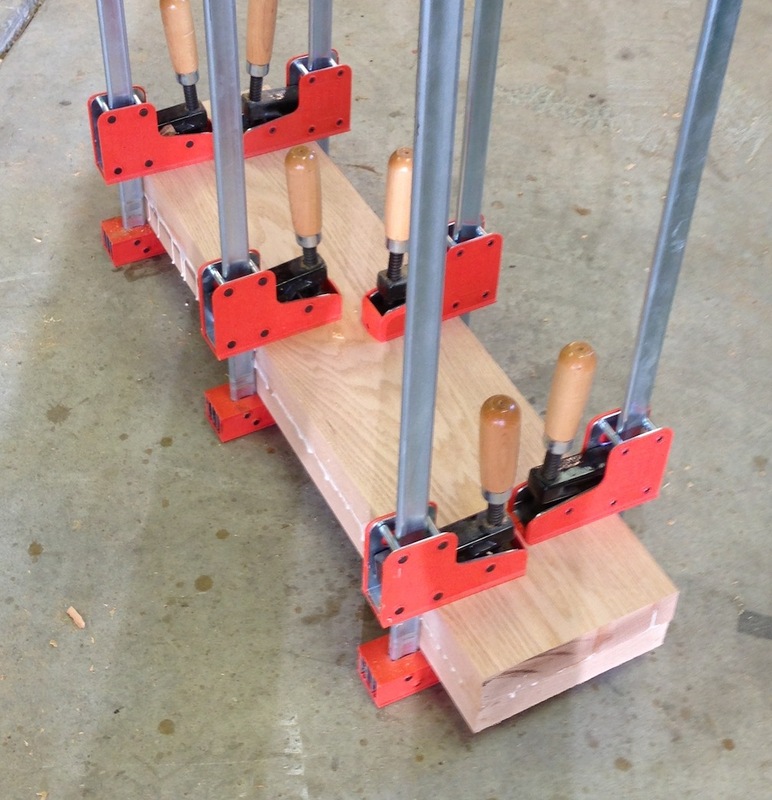 Yesterday I glued up the three layers for my leg vise chop. You can read about the saga in my previous blog posts, but long story short – I want to leave the lamination in clamps as long as possible. I’m using the glue drips I scraped off as a gauge, the thick ones are still slightly rubbery. I’m going to wait until they are completely hard, or until tomorrow at noon when I’ll probably run out of patience. I can do the first two steps on the bench leg, but I need to wait another day for the chop lamination to dry before I can really finish that. 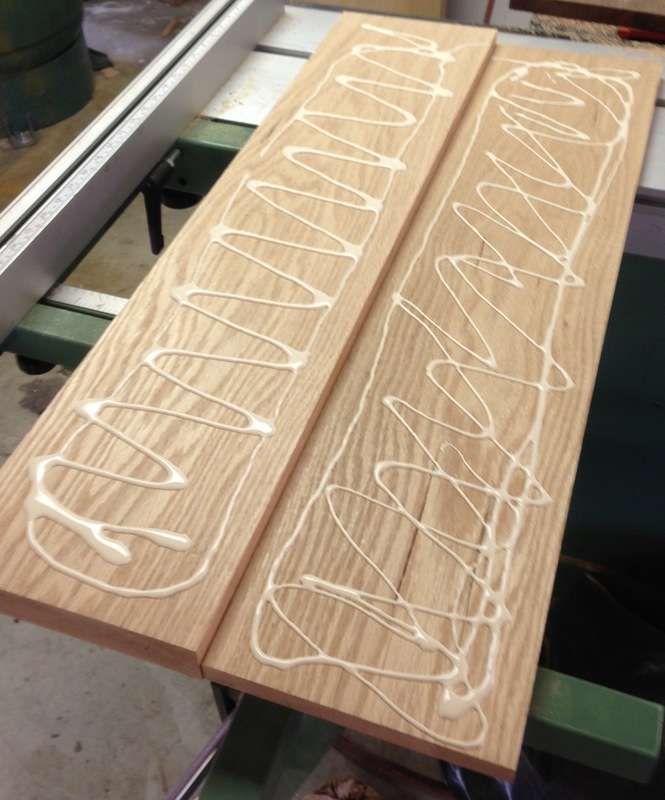 But I was thinking about how I was going to make the slot and decided to use a router to hog out the material. Rather than try to freehand this, or use some sort of fiddly fence setup I decided to try pattern routing it. So, of course my day started with making a template. Which now has to dry for at least a half dozen hours. 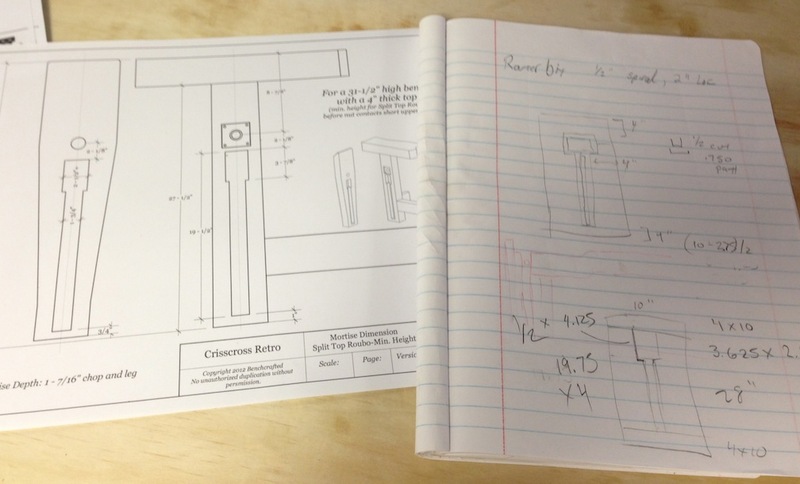 I did a quick sketch, I’m going to use a 3/4″ guide bush with a 1/2″ bit, so the math is pretty easy – the template opening needs to be 1/4″ larger (1/8″ all around). The simplest way I could see to make this was to edge join some sheet goods. MDF I could have just edge glued, but all I had on hand was the leftover cheesy Home Despot plywood. I cut out the four pieces, and cut a notch in the end. I decided to use some biscuits to assemble this. I’ll use plenty of glue on the joints, but the biscuits should provide enough strength for this to hold together to route two parts. I slathered everything with plenty of glue and clamped it up. Now I need to leave it alone until I’m ready to cut the mortises for the Crisscross glide. This should make the process dead simple. While I wait for the template and leg chop to dry I can start on the draw bore setup. In Zen & the Art of Motorcycle Maintenance Robert Persig writes about (among other things) what he calls “Gumption Traps”. In short, these gumption traps are things that prevent you from moving forward on a project because of some problem. 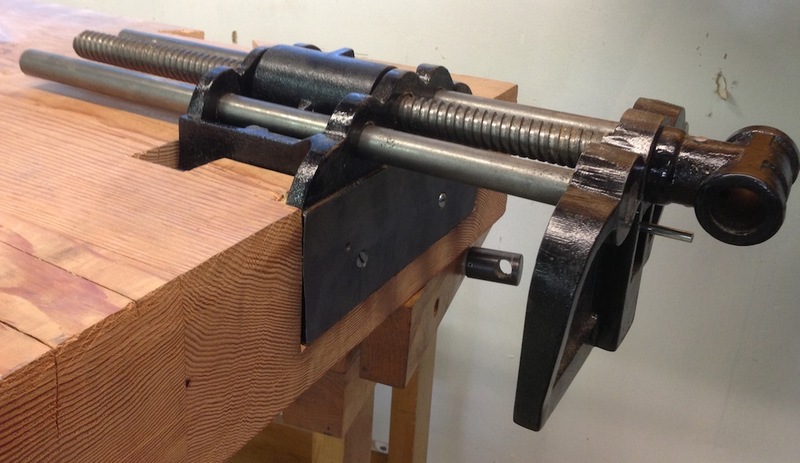 This occurred to me as I’ve been pondering the dilemma that is my leg vise. It’s all too easy to get embroiled in the problems, and it’s important to be able to step back, problem solve and move forward again. I’ve decided to press forward with the Crisscross. 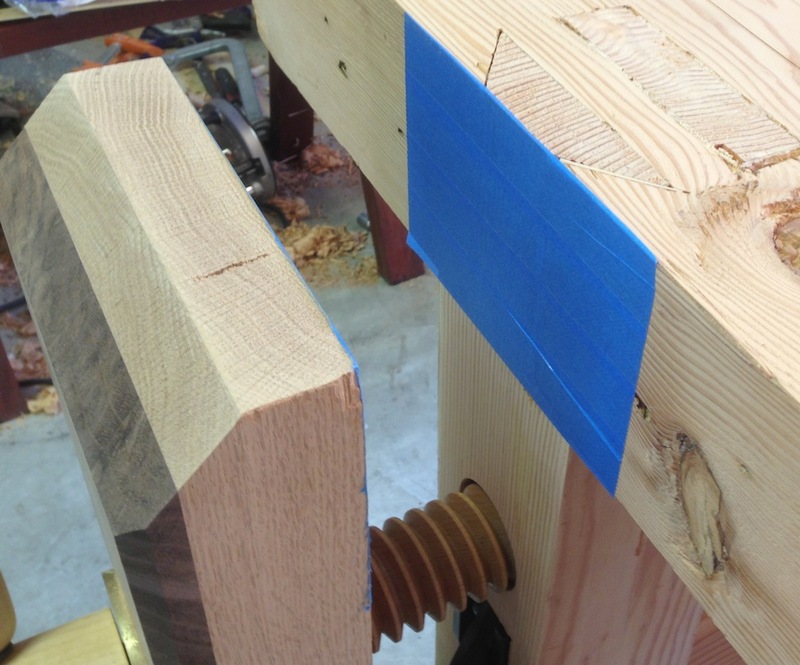 The fix for the problem of weakening the stretcher tenon is not a big deal, I’ll make a brace to reinforce that one joint. Not a big deal. 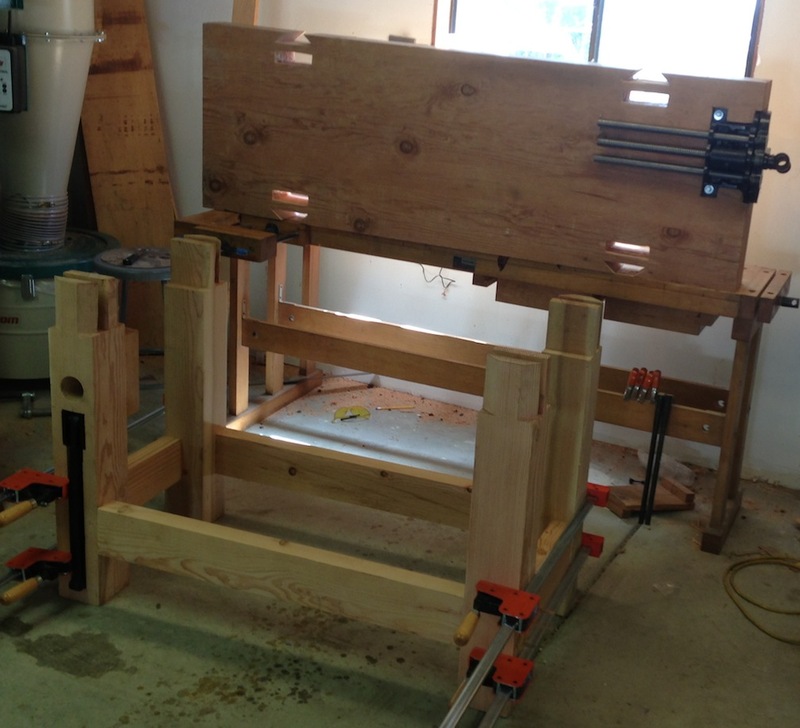 In fact I just went out to the shop to glue-up the now-acclimated pieces for my leg vise. Guess what? Turns out “acclimated” is a five dollar word for “warped”. Now, getting rid of this cupping isn’t a big deal, but I’m already under where I should be in terms of the necessary thickness for the vise chop. 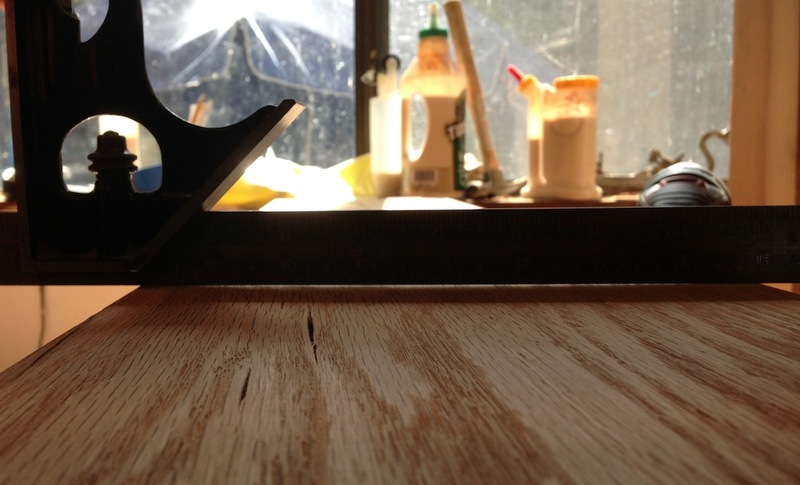 By the time I remove wood from both faces of both boards I’ll be at least 1/4″ under, maybe more. So, I can pick up a scrap of 4/4 red oak and laminate three boards together for the chop, or I can start over and just get a piece of 12/4 something. I’m leaning toward the later, although it means that my expensive piece of 8/4 red oak was a waste. In hindsight I think this board was badly dried. 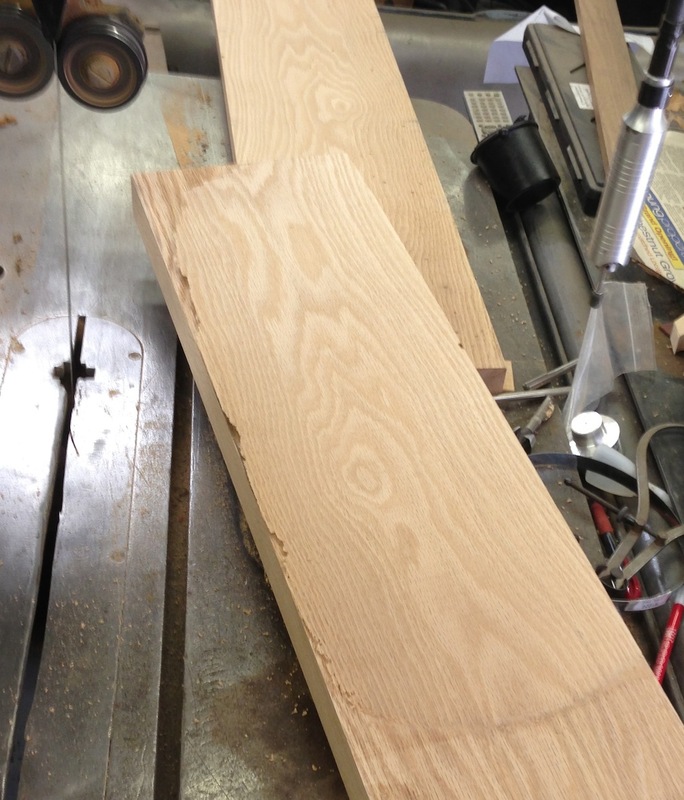 I noticed several bad checks in it when I planed it, including one that goes completely through the 4/4 thickness. Rats. I need about 6 board feet of 12/4 wood. 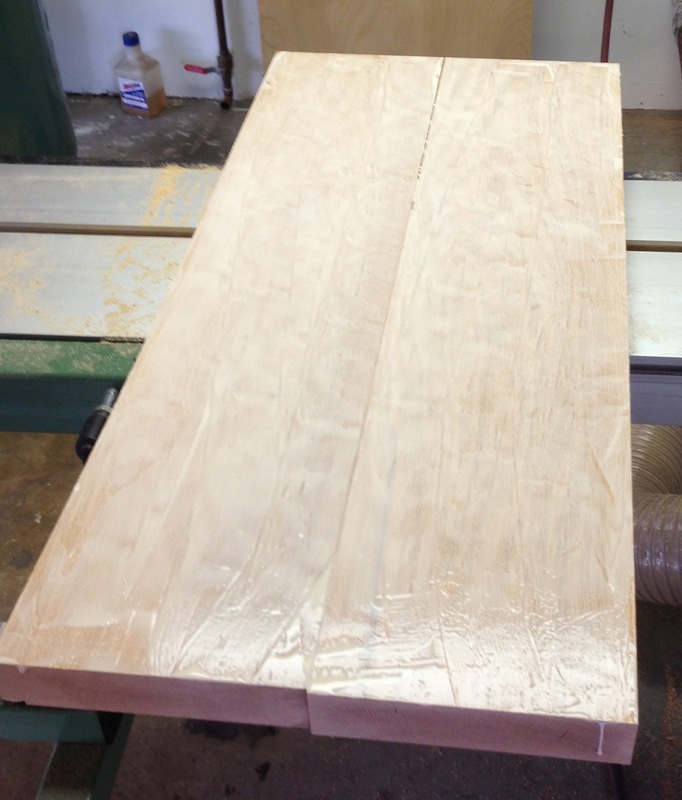 I know Southern Lumber has 12/4 Poplar for $9/bf (which is really expensive for Poplar and typical of their prices), I think I saw some 12/4 Swamp Ash at Global Wood recently for a bit less. I’ll have to check that out tomorrow. Offsetting this little bit of bad news, my Crisscross arrived yesterday, a day early (thanks USPS!) It’s nice, and I’m looking forward to putting it into service. 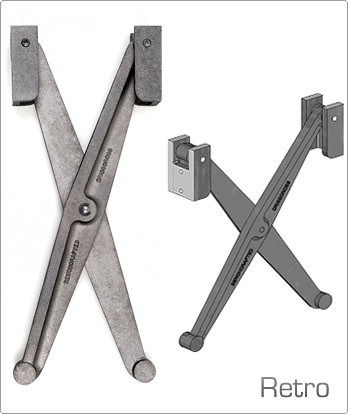 So I was reading through the instructions for the Crisscross guide I ordered for my leg vise when I was struck with a sudden feeling of dread. 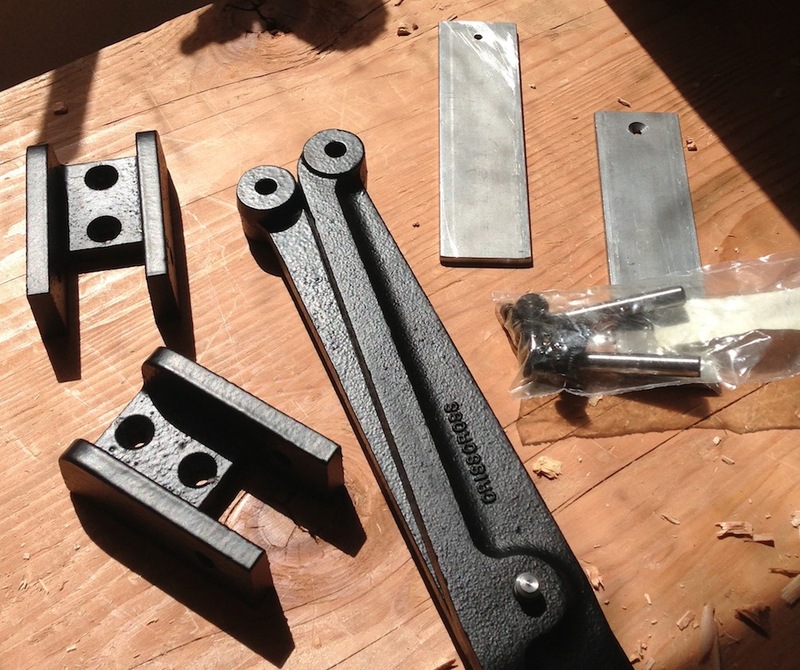 The mortise for the Crisscross mechanism needs to be 19.5″ long, 1.75″ wide and 1.4375″ deep. As I was staring at the diagram in the instructions I had that sinking feeling… Can you see it yet? Here is a hint. 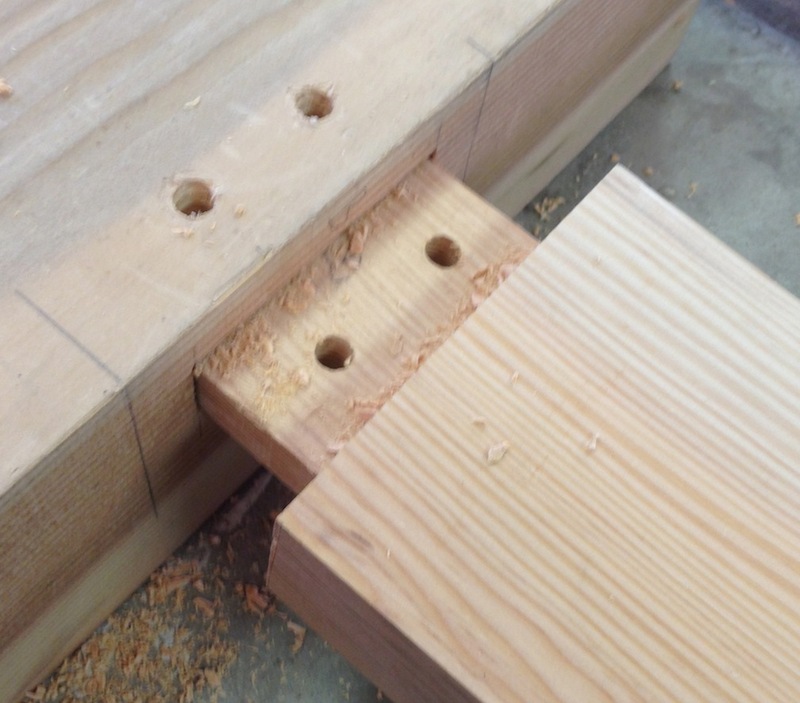 What is going to intersect the mortise (slot) for the Crisscross? 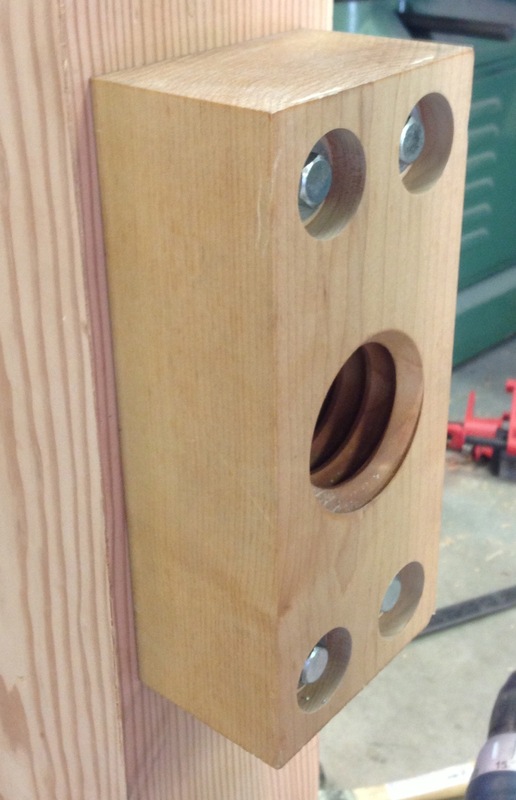 Why, the tenon on my front stretcher of course. 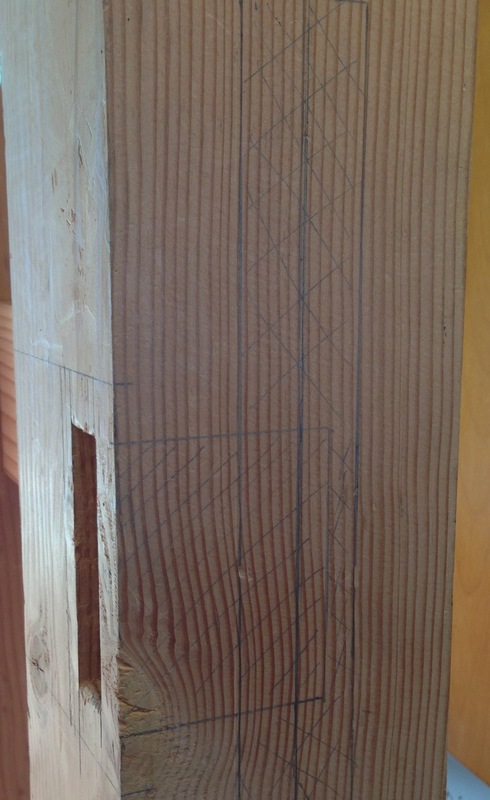 If you look closely at the picture below you can see where I’ve drawn in the slot for the Crisscross and the mortise for the stretcher. 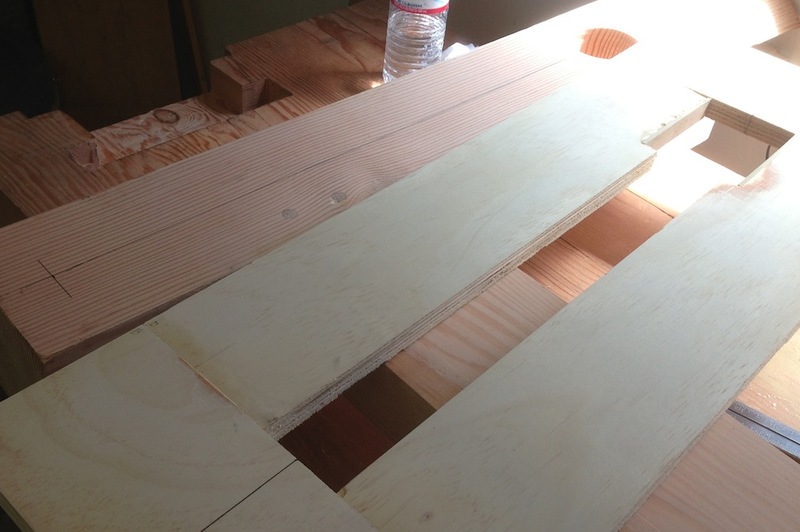 Now, if I hadn’t already cut all of the mortises for the stretchers this would be relatively easy to avoid. 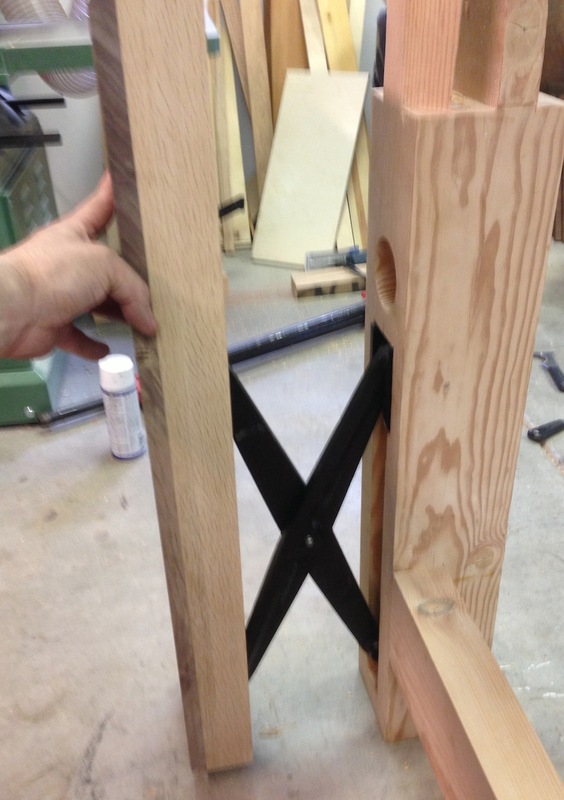 Just move the tenons to the beck of the stretchers. 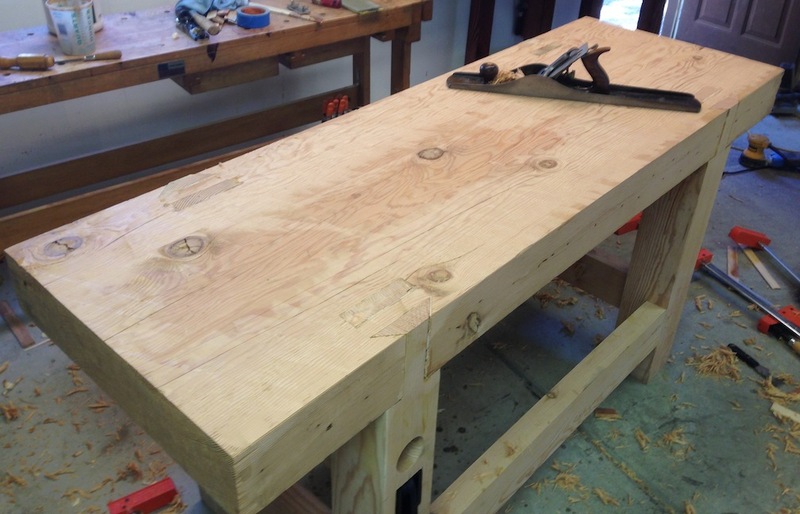 However, I have already cut all the tenons and chopped all of the mortises. Dang. Well, first, I can rout out the slot for the Crisscross until I’ve assembled the base because I’ll need to cut through the tenon. 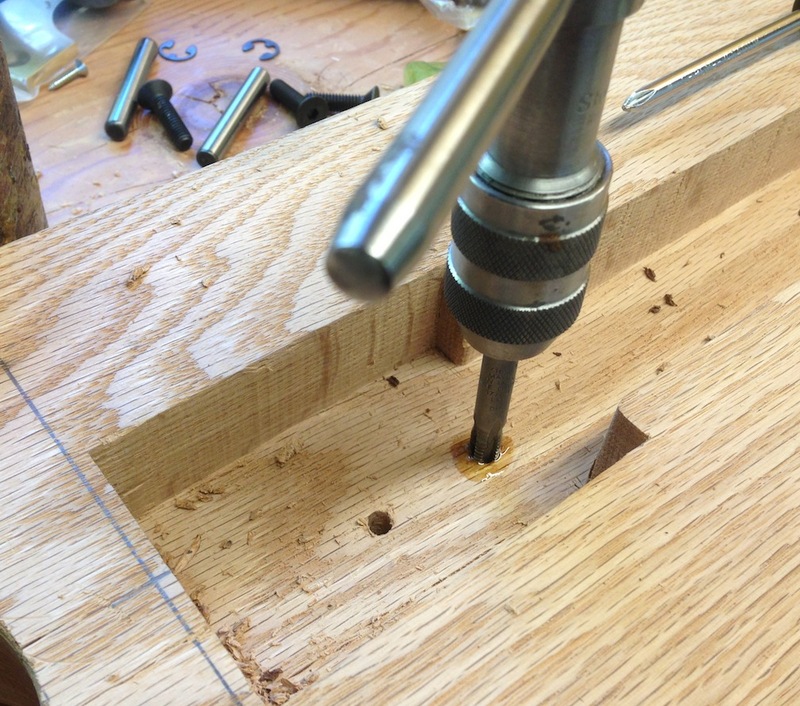 That also weakens the tenon, and if this bench is anything less than absolutely rock solid then it’s a fail. 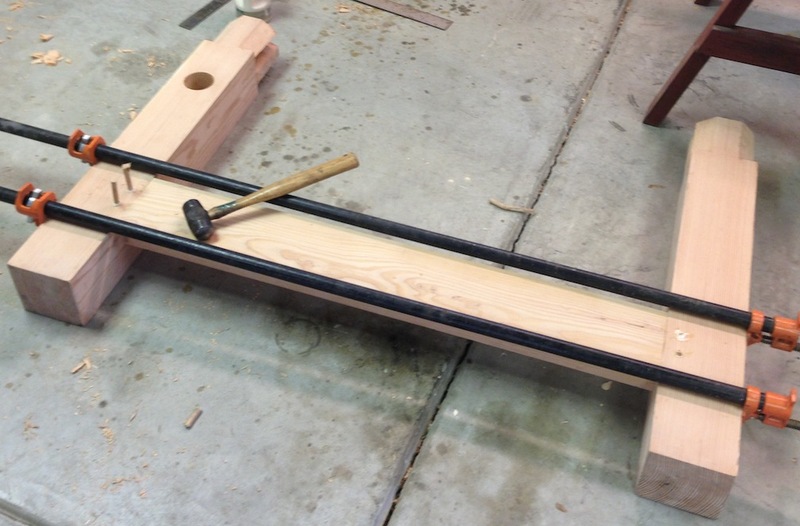 I can (and will) drawbore the joints, and that should help reinforce this joint. 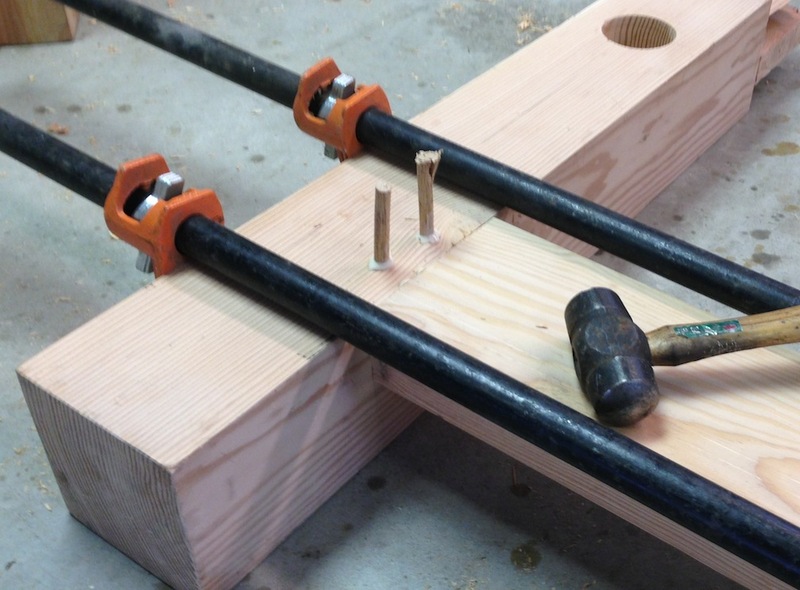 I could also drive some long lag bolts through the leg into the end of the stretcher (or use barrel nuts) to reinforce it, but that strikes me as sloppy. What other options do I have? I could change directions and not use the Crisscross. But I don’t want to do that. I could re-make this one leg and the stretcher, but I don’t see that happening either. If the bench loosens up in the future I’ll have to deal with it then. 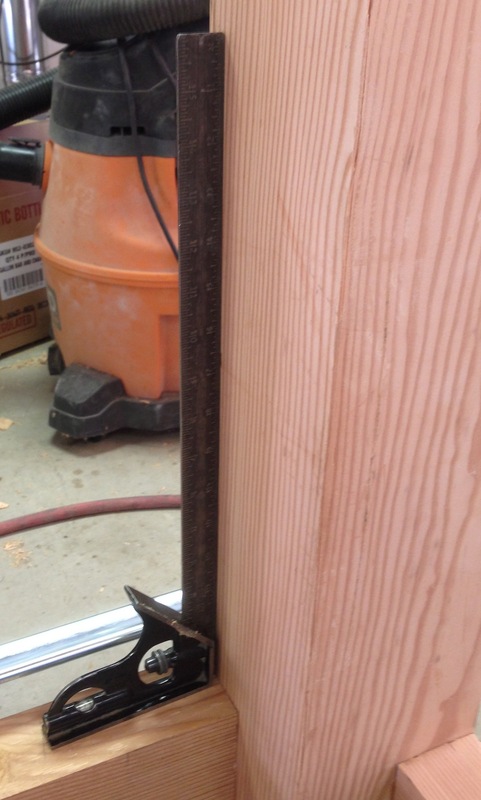 I can always screw on some plywood shear walls, because we all know that would e attractive. 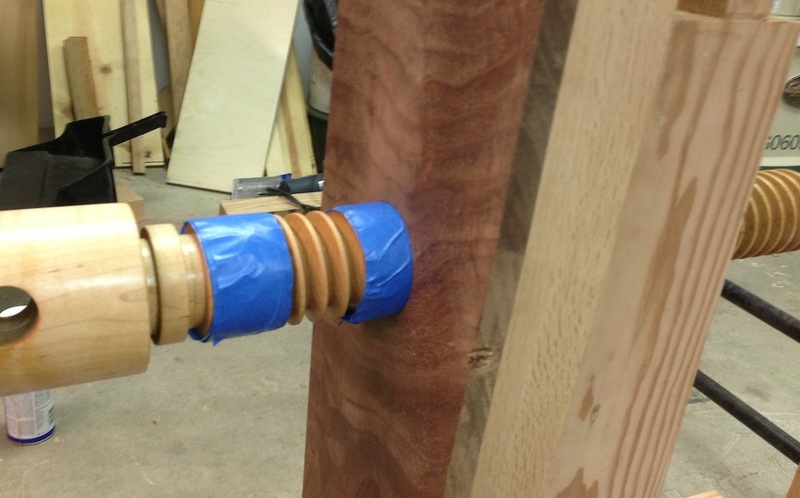 I decided that I needed to properly fix the leg vise lamination. I really didn’t want to saw it apart, but that’s the only way to fix it I could see. 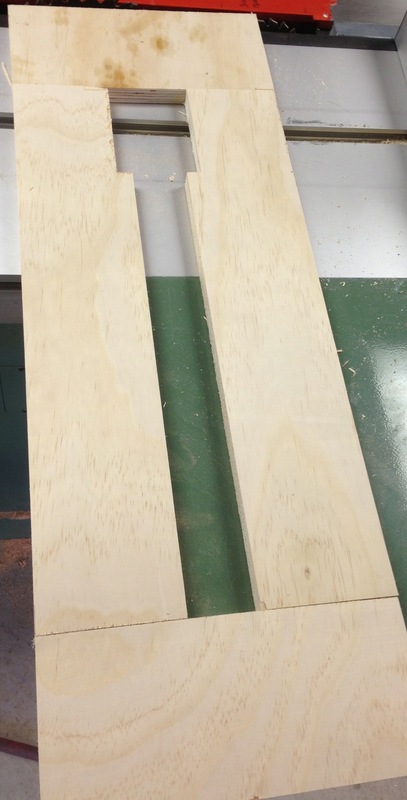 Then I planned both the sawn face and the cupped faces flat. Unfortunately that leaves me just under 2.5″ of thickness. 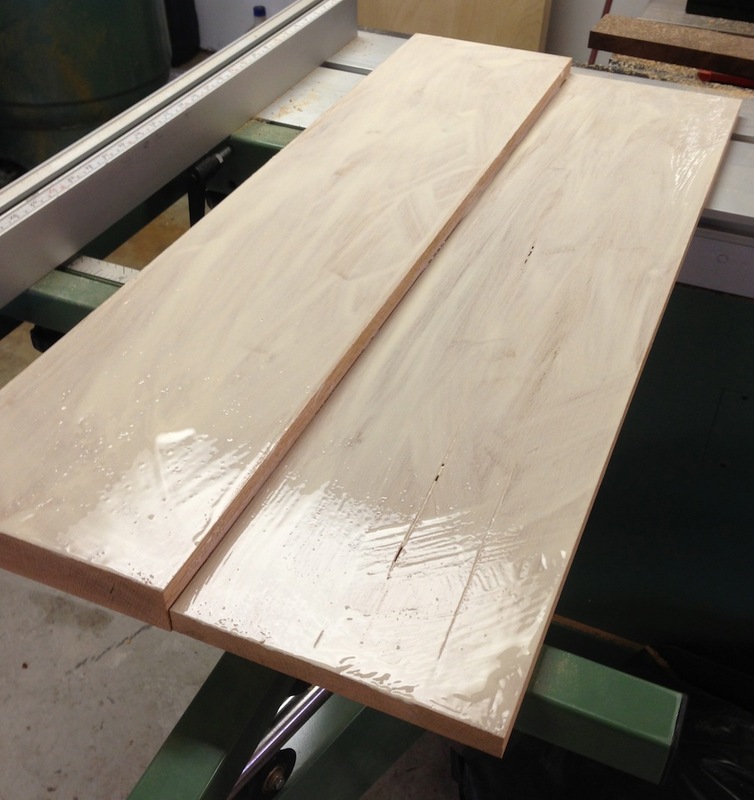 The thinner board also had a 1/16″ bow end-to-end after sawing it free that I had to take out before feeding it into the planer. 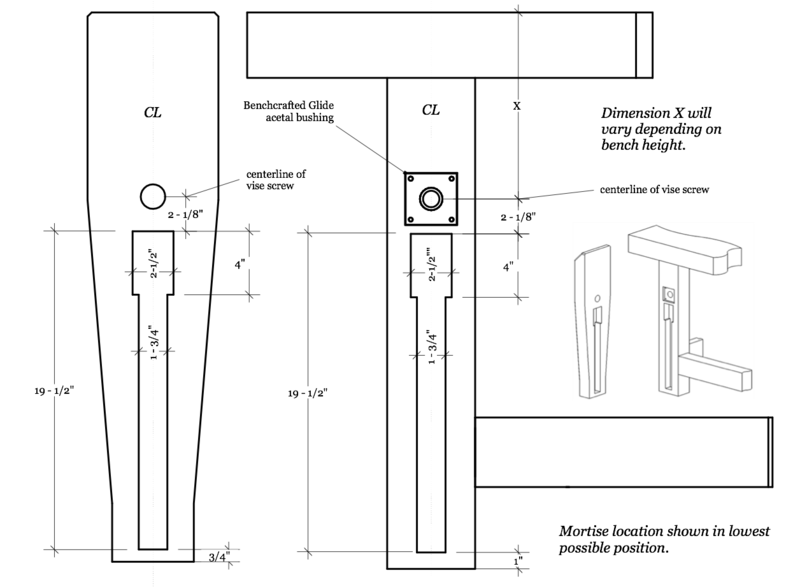 According to the instructions for the Benchcrafted Criss-Cross, I need a leg chop at least 2.5″ thick because of the large slot I have to cut into it for the mechanism. 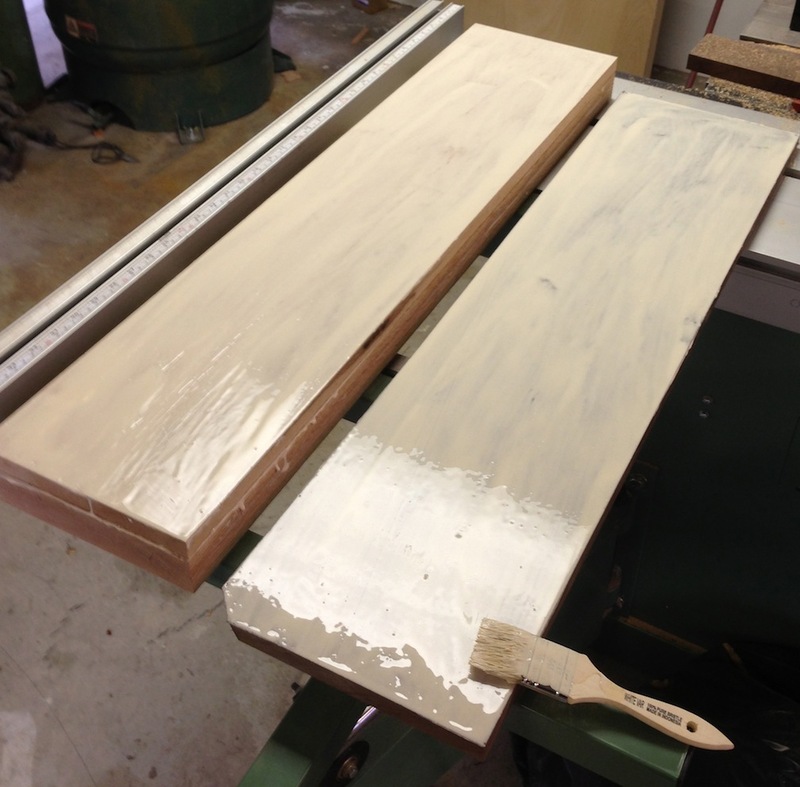 I don’t know if the 1/8″ that I’m shy really matters, or if I should add more thickness. 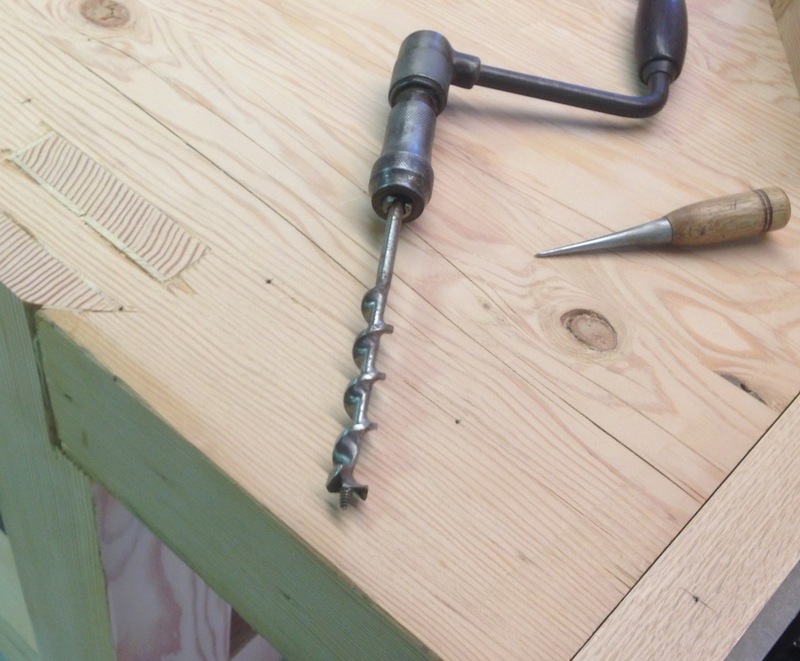 Or maybe recess the mechanism 1/8″ deeper into the leg than the chop. Maybe it’s worth an email to Jameel at Benchcrafted? I’d like to tell you that my day in the shop went well after that. I’d really like to tell you that, but I’d be lying. 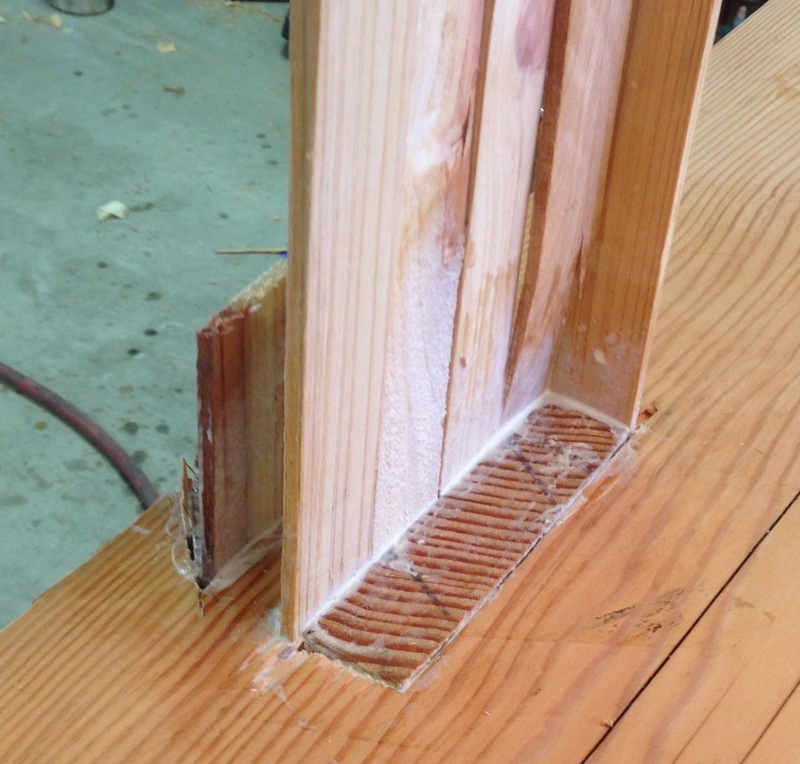 First, and this is slightly embarrassing, I decided to install the end vise while my boards sat and reflected on their little attitude problem. I slid the stool over towards the end of the bench and made to sit down. Somehow I tripped or lost my balance and fell flat onto the small of my back. I had a bulging disk that laid me up for a couple of weeks several years ago, so this was a little frightening and fairly painful. I iced my lower back and took it easy for the rest of the day. I’m sore, but I don’t think I’ve done anything too serious to my back. Later I decided to go finish installing the vise. Moving very carefully so as not to tweak my back, I put in the two screws into the face of the vise, then started to put in the lag bolts that attach the vise to the bottom of the bench. I started them both by hand (having previously drilled pilot holes and run the bolts in when I test fit it) and put the socket wrench on the bolt to tighten it down. It snapped, without any pressure on the wrench. It wasn’t even tightened down. I think the gods were sending me a message, although I’m not sure if the message was “go lay down” or “don’t buy lag bolts at the hardware store”.